Boaterz n Bikerz of America Hull of a Tour: The Lobster Roll is back. Tour riders stopped Sunday at the Height of Land observation station on top of Spruce Mountain in Rangeley, Maine. Boaterz n Bikerz of America Hull of a Tour: The Lobster Roll is back, and this is the first official blog from the actual ride. Welcome: We’re glad you’re along for the seven-day extravaganza through four New England states. Our first captain’s meeting was held Friday at 6 p.m. in Portland, Maine, and there were a lot of hugs among old friends and newcomers alike. Although this is the smallest crew — 13 to start, with a few perhaps joining down the road — there was an abundance of energy and enthusiasm. We’ve had as many as 35 riders in the past, but a smaller group makes coordination and riding a whole lot easier — and dinner reservations a breeze. Speaking of dinner, we hustled out as soon as the meeting wrapped to the DiMillo’s famous floating restaurant in Old Port aboard The Newport. This 206-foot former car ferry, with its massive 65-foot beam, was first commissioned in 1941 and has quite a storied past. It was purchased in 1980 by Tony DiMillo and overhauled and rechristened as a restaurant. Its first meal was served in December 1982. Riders enjoyed dining at the DiMillo’s waterfront restaurant in Old Port, Maine, aboard The Newport (far left). Photo by PortlandOldPort.com. The DiMillo family is not just famous for the divine fresh seafood and succulent chops; you might say they are also the area’s first family of boating. They own DiMillo’s Marina and DiMillo’s Yacht Sales, nestled together with the floating gold mine in the charming, picturesque harbor. I had the pleasure of meeting the founder’s son, Dan DiMillo, who generously arranged for our crew to dine in first-class quarters with a great view of the marina. Everyone agreed: Our meals exceeded expectations (did I mention lobster), as did the excellent service. While we were dining like royalty, Dan’s brother Steve, who manages the restaurant — himself a boating and motorcycle enthusiast — stopped by the table to welcome the Hull of a Tour to Portland. We thanked our gracious hosts and left with full bellies. Saturday dawned cloudy with a brisk 61 degrees, but there wasn’t a complaint in the ranks. We were grateful that the predicted rain missed us, and the Florida riders among us appreciated the cool morning, compared with our traditional blistering summer heat. Our first destination for the official tour launch was an hour’s ride to sponsor Moose Landing Marina in Naples, Maine, where we met GM Jason Allen, sales manager Will Monson and director of marketing Tracy Coughlin, who treated us to a lovely continental breakfast dockside, followed by a spectacular waterfront tour of Brandy Pond, the Songo River and Long Lake. 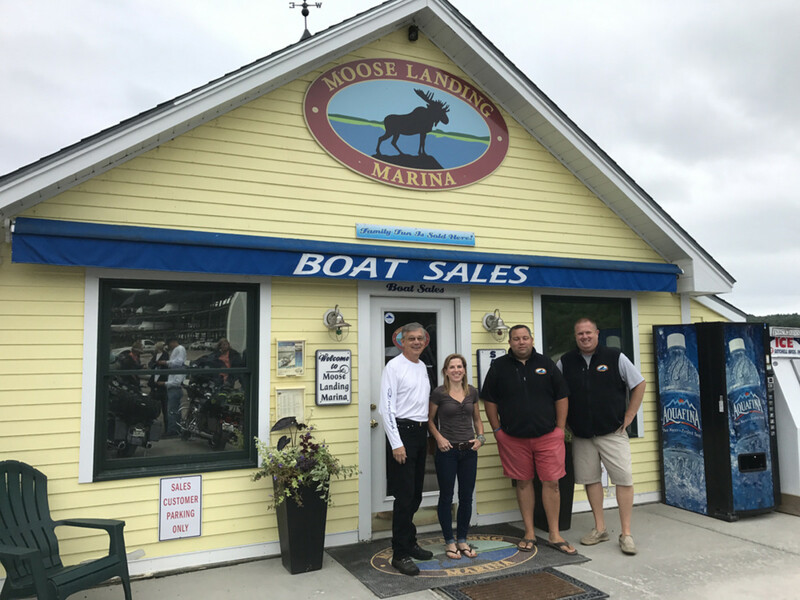 Jim Krueger (left), regional sales manager for Regal Boats, and Moose Landing Marina managers welcomed the riders and launched the tour. We loaded up and rode in style aboard a beautiful steel blue Regal 23 and a black and red Regal 25 ably captained by our hosts. The dealership is Maine’s largest deckboat and pontoon dealer and the No. 2 Yamaha dealer in New England. 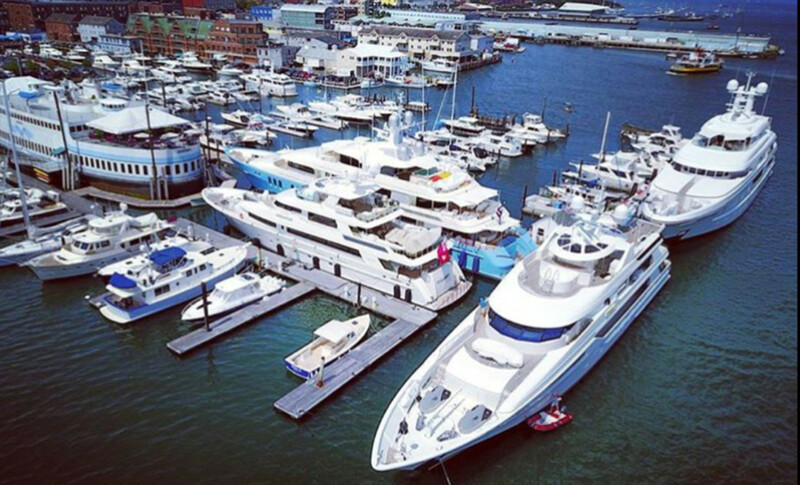 The owners run a first-class operation with in-water and dry storage slips and it is the largest marina in the region. Tour members enjoy a tour of Brandy Pond aboard a 25-foot Regal from Moose Landing Marina. It was an awesome way to launch the tour this year! The next stretch was nothing short of spectacular as we cruised in formation into New Hampshire and rode the legendary Kancamagus Highway, a 56-mile thrilling stretch in northern New Hampshire that winds though the scenic White Mountain National Forest. It was the No. 1-recommended motorcycle ride in all of New England and we all loved it. We stopped for a few minutes to stretch our legs at the Lower Falls, an observation area that draws plenty of locals and tourists alike to sight see, climb a giant boulder or splash in the ripping-fast and icy cold waters. Our bikes were packed, and we were on the road by 8 am, heading to Eustis, Maine. We rode some great roads, as well as some pretty gnarly, teeth-jarring roads en route to a special destination: the Height of Land observation station. Anyone who has ever gone on one of our tours knows that my partner in crime in this event, Jim Krueger, is the consummate pro when it comes to route planning. He spends months poring through maps and data to find the absolute most stunning places to ride and visit. The Height of Land on top of Spruce Mountain in Rangeley happened to be one of those special spots. We were hightailing it on Maine Route 17 when Jim gave the turn signal and we had arrived. Everyone parked their bikes and we collectively gasped at the panoramic beauty before us. The Mooselookmeguntic Lake (yes, I looked it up) below is the breathtaking centerpiece to this high-rise vista, flanked by majestic mountains with crisp blue skies overhead. We took it all in, snapped multiple shots and then hit the road for our afternoon soiree. 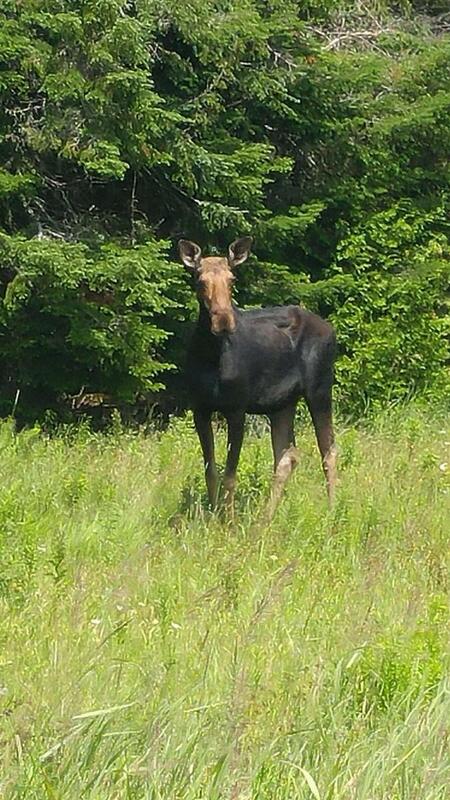 En route, we all stopped to view Bullwinkle in all of his glory grazing on the side of the road. There’s something to be said for all of those “moose warning” signs on the highways. A moose stopped to check out the tour riders. We arrived in Caratunk, Maine, population 87, and hustled in to get ready for our afternoon’s tubing and barbecue activity, hosted by our new power sponsor this year, Evinrude BRP. 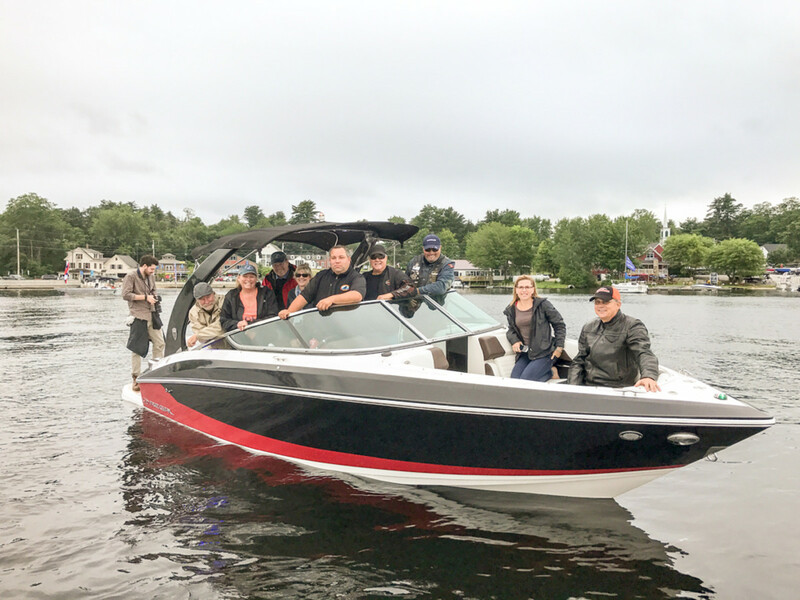 We’re thrilled to welcome Evinrude and especially pleased to have Evinrude regional sales director and former Hull of a Tour rider Andy Lindstrom with us again this year. We had hired a local outfitter in The Forks area to coordinate a lazy tubing party for us down the Kennebec River in an area known for its whitewater rafting activities. We were a little delayed on our start time, and unbeknownst to us the dam operator controls the water flow. After we had dropped into the river, the water level followed suit. Four of us landed on the rocks and had a challenging time navigating and getting back into the current, thanks to the slippery rocks and only our hands for paddles. For a period of time, the cruising was easy and relaxing. I saw an eagle swoop down below the tree line, and that was exciting! We also experienced a chilling rainstorm toward the end, but our hardy band, including retired marine industry executive Duffy Stenger, kept the jokes flowing as we belted out the theme of “Gilligan’s Island” — a three hour tour. Moral of the story? Yours truly as the meeting planner who selects and plans the special events promises that the only boating activity in the future will be on powerboats or sailboats. All was not lost, however. We happily climbed up a steep muddy slope and crawled into a heated van, huddling in our towels. We returned to the bed and breakfast where we were staying, changed our clothes and returned to the Inn by the River, where a delicious barbecue on the grill awaited us with chicken, burgers and salmon, topped with fresh pasta salad, grilled pineapple and grilled corn with aioli. Yum! A live reggae band, a toasty fire pit and hanging out with some mighty fine folks made it an event to remember. Next we’ve got a 6.5-hour ride to Lubec on tap, at the Maine and Canadian border. We’ve got some great roads and a really fun boating activity planned. Boaterz n Bikerz of America Hull of a Tour: The Lobster Roll is presented by the title sponsor Freedom Boat Club; boat sponsor Regal Boats; media sponsor Soundings Trade Only; official chase vehicle sponsor Sea Tow; power partner BRP/Evinrude; and event sponsors Moose Landing Marina, Freedom Boat Club of New Hampshire and Freedom Boat Club of Rhode Island; the Massachusetts Marine Trades Association; and Kenton Smith Marketing.